Designing your own custom home is a great way to personalize your living space to meet your unique needs and wants. But, before you can walk through the front door of your dream home, you’ll need to make sure your contractor is working off of a CAD design that aligns with your vision. To ensure you’re getting precise designs from a drafting service in Lakeland, FL that’s experienced and talented, entrust your home design to Central Florida Designs LLC! We’re happy to provide exceptional drafting services that perfectly and proportionately lay out the floor plan of your home, to ensure it’s being built to spec and developed to meet your vision. New homes: If you’re building a new home from the ground up, trust us when it comes to home floor plans in Lakeland, FL. 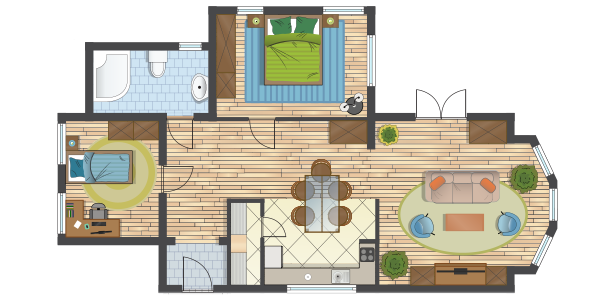 We’ll ensure the floor plan is precise and accurate to your needs right from the get-go. Custom home design: The opportunity to partake in custom home design in Lakeland, FL is a once in a lifetime prospect for many homeowners and one that needs to be approached with care and consideration. We’ll help you make sure your design is viable and ready for the extensive build process ahead of it. Additions and remodels: Expanding your home? Changing the layout to better suit your needs? We’re able to provide you with drafting services for your addition or remodel, to ensure it’s executed with a solid foundation of reference. No matter if you’re building a new home, remodeling your existing home or adding on to your living space, Central Florida Designs LLC is here to provide you with the critical drafting services you’ll need to execute perfectly, to attain ideal results. For more information about any of the residential drafting services we offer or to inquire about drafting services in Lakeland, FL, give us a call today at 863-398-5594. If you require drafting services for your residential home or commercial business, contact us to set up a consultation appointment today.